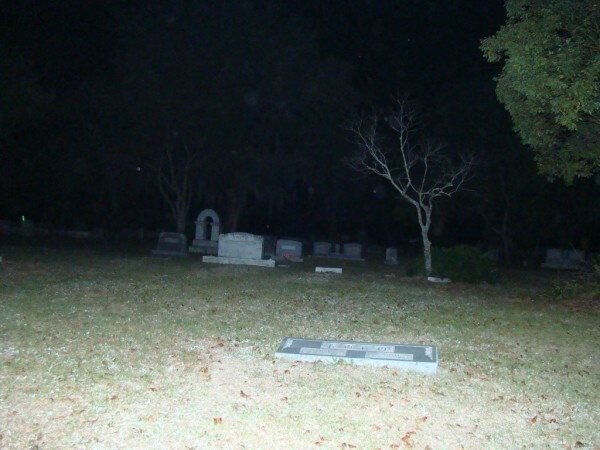 The Umatilla Cemetery was a location that I had long wanted to investigate. 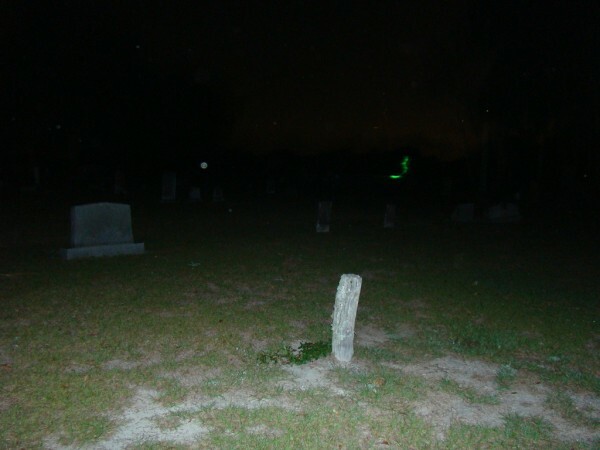 There are reports on "Shadowlands" website about the spirits in this cemetery not being benevolent and that inexperienced investigators should not attempt to investigate this place with out assistance. While getting permission to conduct this investigation, our team was referred to a couple of people for first hand reports of this cemetery. Several people related that there were unexplained noises and a general feeling of unease to the area at night. A previous investigating team, who had a psychic on there team, said they got several EVP's, and also captured an apparition walking down the road during the investigation. 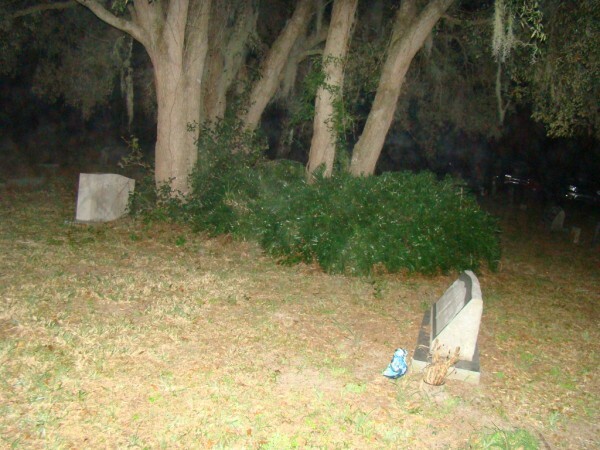 They also spoke with the neighbors who were experiencing some unusual events and the psychic, felt there was a portal at this home and that was the cause of the family's paranormal problems. We were told that the portal was closed on that evening and the family later reported that the paranormal activity in the home had abated. 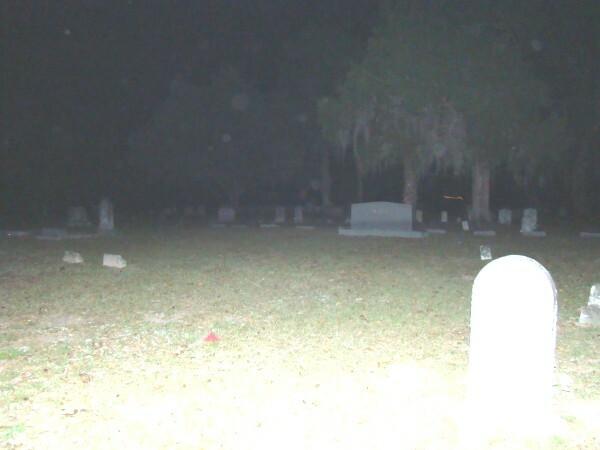 We started the Umatilla Cemetery Investigation at 9pm. The members present for this investigation were Shereen, Jen, Tracy, Lynn, Erin, Mac and Sherry L. With the main road going right through the middle of the cemetery this created an obvious divider of the grounds, and it was decided that we would also divide into two teams to cover either side. 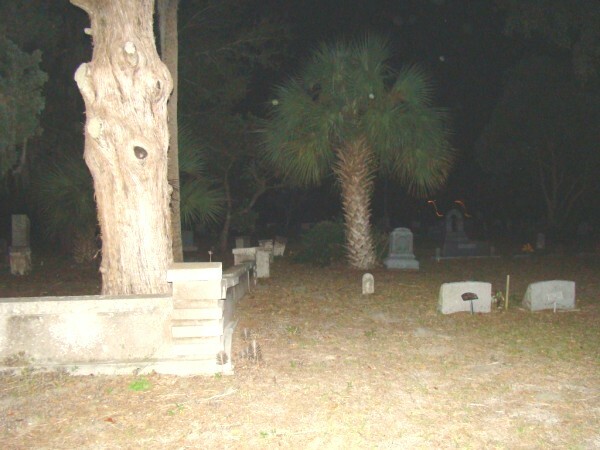 My team consisted of Myself, Tracy and Erin and we were assigned to investigate the older side of the cemetery that is surrounded by the orange grove on three sides. 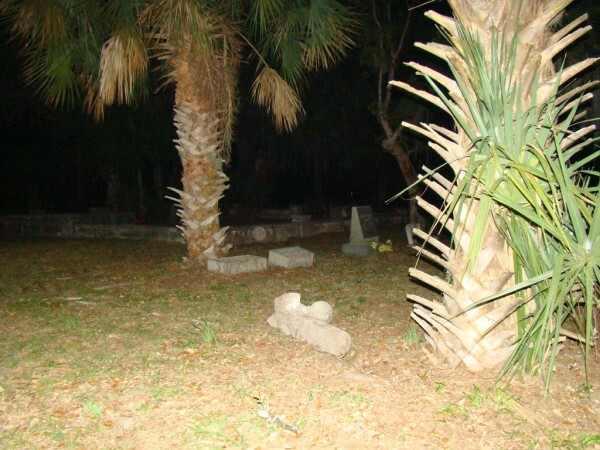 We started out by placing two EVP recorders in different locations, the Austin tomb and an obelisk to the front left. We then proceeded to walk through the entire side taking baseline temp and EMF readings. Erin reported that the baseline temp was 56. My baseline EMF reading was 0. While conducting the initial walk through, as we reached the back left side I walked down the row to the left of the Austin tomb and experienced the feeling of cobwebs brushing my face, but could not find any webs to account for this. (But since I was walking in the lead position and no one had previously passed through the aisle this could not be excluded as actually being cobwebs) Tracy was to my left and behind me and she reported the feeling of having something brush the top of her head. A thorough search of the area revealed that there were no branches or moss hanging over head that could have accounted for this. During both of these occurrences we noted no change in temperature or EMF readings to help validate these experiences. At approximately 9:30 we heard some talking and noted that some of the neighbors were coming up the roadway. There were 3 females and one male, all in the age range of 18-22 who then entered the cemetery. They were talking loudly and were not aware that we were in the cemetery. We made our presence known to them, and informed them that we had permission of the local sheriffs department and City Hall to be there and asked them to complete there business so we could continue to conduct our investigation. 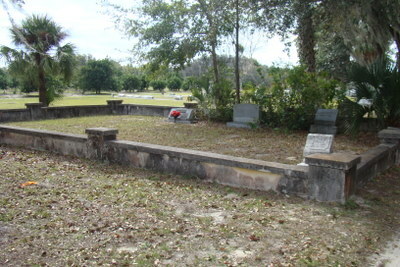 The boy related that he had lived in the house next door most of his life and that there had always be paranormal activity experienced in this cemetery, such as hearing voices and such at night. He also stated that at one time there had been a psychic who visited his home and found a portal there that he then claimed to close. (This collaborates the earlier story that we had been told.) The group left the cemetery shortly after this. At 10:00, both groups came back together and took a break until approximately 10:30. 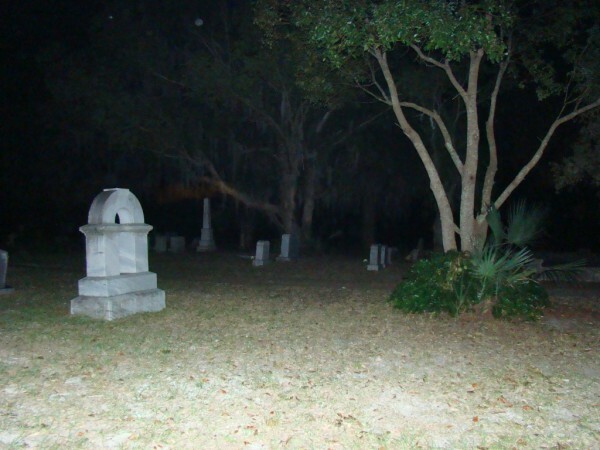 During this time several members reported hearing vague voices within the cemetery. 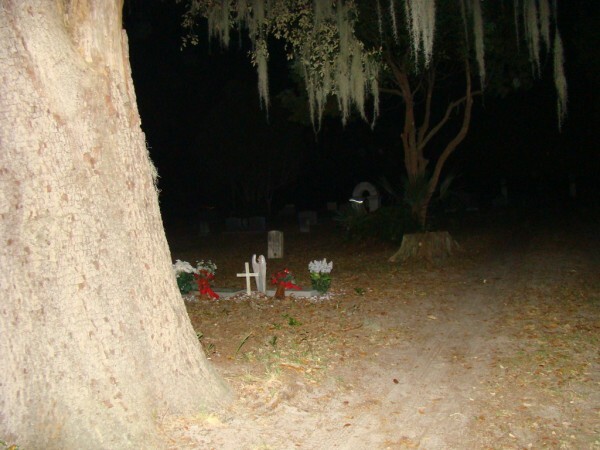 At 10:45 my group proceeded to the lake side of the cemetery to start our investigation. Again we conducted baseline temp and EMF readings which were the same as previously recorded. During the next hour the group had no unusual events to report. We were then called to the other side to help the other group which consisted of Jen, Lynn, Mac and Sherry L. with their investigation. 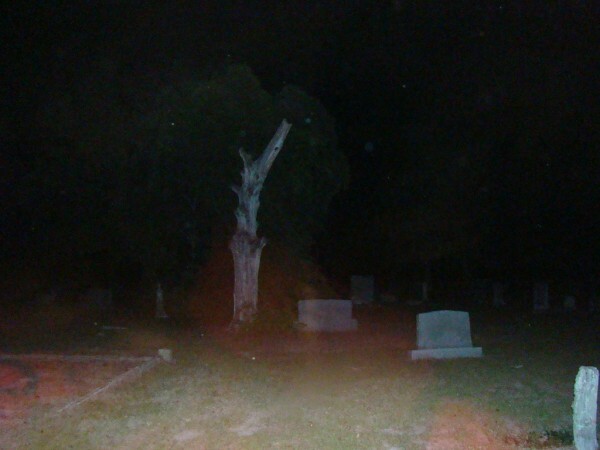 They reported that Jen was walking in the lead and as she came down the aisle to the left and just before the Austin tomb, she looked to her left and saw a black mass that was about six feet tall and four feet wide come out from behind the tree and shot off to the back of the cemetery. Sherry L. related at that point she noted a 5 degree rise in the temperature reading, but no fluctuations in the EMF readings were noted. We attempted to recreate this experience with monitoring the reflections from car headlights on the road, but none of this would recreate the black shadowy mass that Jen reported seeing. The investigation progressed uneventfully until about 1:00am, when it was noted by several team members that there appeared to be a lot of activity in the trees above us. There was no actual wind noted that would account for this. Most of our team members also reported a general feeling of uneasiness and a couple related that they felt they were being watched. There were no correlating EMF or temperature changes noted at this time. The investigation was ended at approximately 1:30am. Most all of the group reported feelings of unease, of being watched, Jennifers sighting of the mass, Tracy being touched on the head, all happened in the left back part of the older side of the cemetery, between the Austin tomb and the orange groves. 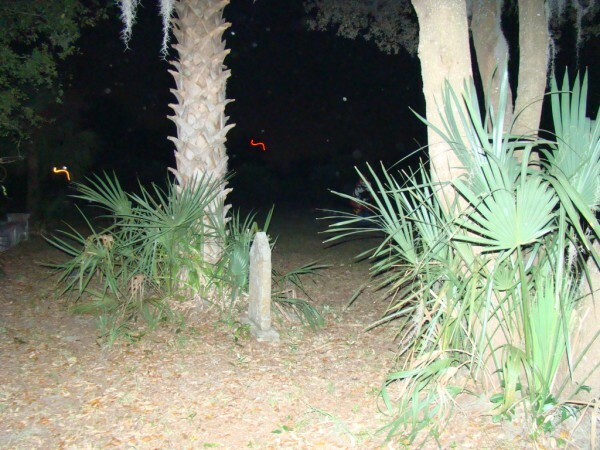 Upon review of the photos, we found that we had multiple pictures with large orbs and several pictures with red, orange and green "energy ribbons or strands" and rods. We also have a picture with white mist and one with a red mist in it. But one member of our team was wearing a head lamp with a red light on it, and even though she was not in the vicinity with the light on at the time the picture was taken, we have to concede that it could possibly be a reflection from this light and throw out this picture as evidence.